The Parental Controls Tool of your Linksys Smart Wi-Fi allows you to limit which devices can go online on your network during specific times of the day. It allows you to set restrictions to up to 14 devices on your network. This tool enables you to restrict internet access for specific devices used by children or teens in your home. Launch a web browser and enter your router’s IP address or “myrouter.local” in the Address bar then press [Enter]. NOTE: The router’s default IP address is 192.168.1.1. If it doesn’t work or if the IP address has been changed, check your Linksys router's IP address. For instructions, click here. 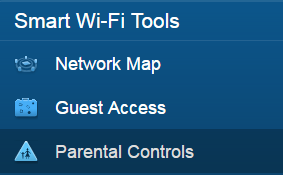 Under the Smart Wi-Fi Tools menu, click on Parental Controls. 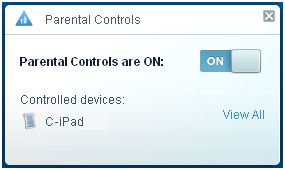 You can now configure the Parental Controls Tool according to your preference. This option lets you enter specific websites that you want to block. Click Add to enter the URL or website address to block. To learn more on how to do this, click here. NOTE: Website addresses with "https://" can be blocked but because they have encryption, Linksys Smart Wi-Fi cannot redirect you. Instead of a page telling you the address has been blocked, you will see a browser-error message. Select the computer or device for which you want to set Parental Controls to, then, specify the limitations you want to apply. Click Never to ensure that a device is able to access the internet at any time. Even if you keep internet access open, you can still use the Block specific sites option to block specific sites for the selected computer or device. For detailed instructions, click here. Click Always to completely block the internet and not let users access the internet at anytime. For detailed instructions, click here. Select the computer or device for which you want to set Parental Controls to on a specific time. For detailed instructions, click here. Click Specific Times to choose specific hours when access to the internet is blocked. During these times, users on the computer or device will not be able to access the internet. NOTE: If you want to learn how to disable the Parental Controls Tool of Linksys Smart Wi-Fi, click here.